I remember when television sets had doors to hide them away. When some programming was a little girl next to a test card for as long as some sitcom seasons. When regional accents in programmes were as welcome as a Page Three girl in a broadsheet. Prelapsarian days when television went to sleep at night, nestled in a blanket of noisy snow. Now there is no escaping television. It's in several rooms in many of our homes, from lounge, to bedroom, to kitchen and spare sets for the kid's bedrooms. It's on mobiles, computers, in pubs, train stations, and chip shops. It's awake and screaming 24/7. While some people turn their noses up at the vacuousness of it all, it has permeated every crevice of life, save for those who refuse to buy a TV licence. What started as a black and white experience has morphed into colour, digital and High- Definition as though the picture were continually honed by a master sharpener to one of such highly defined pixels that warning labels will have to be attached declaring the possibility of cutting yourself on the sharpness. This is because some bright spark discovered digital television, a different way of broadcasting that means where once we had five channels, we can now have 5000 ? from BBC1 to The God Channel, because it all fits on a broadcast wavelength with hexadecimal code. And even for those who complain 'there's never anything good on', the choices keep multiplying, digitally. The government, in its wisdom, has decided that we all need to be digitalised and rather than wait for analogue to die a natural death, it's set about trying to convert the faithless (Analoguists) to its new religion (Digit-Al) much the same way the Spanish Inquisition dealt with heresy. This new ecclesiastical tribunal Digital UK has been set up to ensure all adhere to the new Digit-Al faith or forever live in blackness. Analogue Apocalypse in 2012. Digital UK's ('Not-for-profit', they scream. We only want to help) evangelical approach has now crowded our screens on all channels. It involves a cute animated robot built by the UK's most beloved animator Nick Park and voiced by the most-watched actor Matt Lucas to convince us of the one true way. The annoying little critter is called Digit-Al (geddit? Digit-Al? ), who haunts non-BBC airwaves when they haven't sold any adverts. He is creepily similar to the Smash potato robots. It's going to pay me to get ready for Digital-Al says in his hermeneutic manner. A branch of the new digital religion run by the god-unto-themselves British Broadcasting Corporation continues analogue expurgation movements with its own 'tough love' campaign, where heretics are publically shamed into accepting Digit-Al (although the BBC as a separate sect doesn't acknowledge the tin-god). After constant sermons I recently allowed myself to be dragged into the digital TV Age by my cathode ray tubes. However, I feel like a Marranos in 14th century Spain; tortured by scenes of the 'one true way' and threatened with a date for analogue Armageddon. I relented and allowed my soul to be saved. I sit now, Sky remote in hand with 898 clicks at the ready. From 101 to 999 there's something to see, if only a notice that I've only subscribed the Sky Pauper? package and in order to see the semi-good stuff I'll have to up the ante to the Sky Serf Class? package. I consider myself fortunate however, because before I had only 4.5 channels from which to choose (five! was never full signal strength and the .5 that reached me was subject to the vagaries of British weather). I have digital satellite strength that gives five! a steroidal signal. I now can watch (or not) the offerings of BBC 3 and 4 and multiples of ITV and Channel 4, which, BS (Before Sky), were dangled in front of me, taunting me with its alleged brilliance, but unobtainable unless I converted to the new faith. Having been raised in the analogue ministry and making a career out of its benefits, I held back on religious grounds despite the Apocalypse date set by the government, until I broke. I remember the days when you paid your TV licence and you got your programmes, (although I still feel it should have included all BBC books and a weekly copy of the Radio Times, because my licence money and yours pays for all the information in them). When the rules were changed in the middle of the game and the hedonistic idolatry of digital infected the country, we still had to pay for BBC analogue programmes while being denied the better ones on the digital platform, simply because we refused to acknowledge the new god of Hexadecimal. And, by following the old faith, we were cast into Limbo, until cleansed of all analogue sins and willing to accept the new god. And still they taunt us. Episodes of 'tough love' adverts, with friends and family united to convince you to change from your analogue sins and embrace the new Digital religion, followed by a friendly robot (Digit-Al I think), stopping you from throwing out Mum's old set. For most it makes for happy times. But, ever the heretic, despite my reluctant conversion, I must complain about digital TV, for it has taken 3 seconds out of my life. That is the price we all pay. It was only when watching The Weakest Link on digital downstairs that I discovered it ? upstairs was my daughter's un-digitised TV sucking in that old analogue signal like a steam-powered train. The contestant's answers (Thor!) were coming down the stairwell to me while Anne was still asking the digitised question (In Norwegian mythology which God is depicted holding a hammer?). My analogue TV, far from the antique the government and broadcasters would have me believe, was actually speedier than digital. Digit-Al never mentions that in his propaganda broadcasts. Analogue faster than the speed of digital sound? How could that happen? Is it time travel? In this day of faster is better, give me more gigabytes broadband, I have proved that digital is performing slower than analogue sound. And that's not the only deficiency I've found. As someone who actually has 'watched' entire tennis matches on Ceefax, I find a more pronounced slowness when I push my red button now. It is then that I enter the blue-grey ether that Doctor Who travels through until my digital system whips up enough hamster power to find the information I want ? anywhere from 15 to 18 seconds. It is becoming irritating now watching the 'loading' dot.dot.dot while some slow hexadecimal code walks, not runs down a hallway and fetches the precise bit of information I'm requesting from the digital warehouse, turns slowly, brews a tea, has two sips and then walks back to my enhanced digital TV and projects it for me. No, that's not what I wanted. I mean the regional forecast; scroll down, select. Off the new hexadecimal code goes again, down the hallway, a few sips on the tea, grabs the regional and ambles back, stopping to re-tie its hexadecimal laces for health and safety reasons, and then puts it in-vision. We are being sold the future as digital; cars, kitchen appliances, cameras, TV, radio, supermarkets. But the future is sluggish. The future is not performing. There is no instant gratification that is always offered in the morality plays broadcast to get us to convert. I want to know why. We are told it is the land of plenty, more channels, more choice, but it actually is adding to the couch potato time of New Age digitised viewers. What blasphemy! Soon the white vans charged with surveillance of the faithful and punishment of transgressors will catch up with me for speaking out about the Emperor's new clothes. I may be named and shamed for doubting the new technology and face the wrath of Digit-Al. And I shall say to him: "Oi! I want the three seconds I've given to digital returned to me, with interest." Anyways, many thanks for having me in this article. Ever since we went digital I`ve had problems with the signal. Everytime I go antwhere near the arial outlet, the pictue stalls, & sometimes the sound & picture gets out of sync. I think the analogue signal was better. just lost BBC2 analogue here,but have got used to listening to all sporting events on the radio as digital TV is just to far behind the action.Always had radio on for commentary and TV for pictures with sound turned down just not possible now. Totally with you on this one Lafcadio, digital TV is rubbish. Before anyone disagrees, is this how technology has evolved from a broadcast point of view? It's a dark day for broadcasting this year when almost every region in the country switches to 1's and 0's. And another point, HD - not worth all the hype. Not one bit..... give me decent CRT (Like my old Panasonic TX25 and a decent signal (like the one that used to blast out from Winter Hill) anyday. I suppose, however we have to move along with whats given to us (no choice! ), a bit like mp3's.......Vive Vinyl!!!!! Oh, and another thing - more channels means less intelligence in the quality of broadcast.....hop through every channel - you'll see what I mean. We should all embrace change and technology. Ye right! Switched to digital tv had to upgrade areial to get all channels using a wideband one, pulls in everything, every dodgy plug capped scooter or anything else that cares to cause intterference. Now if I had an analogue tv I would get a fizzy line accross the screen, but the much improved digy is completely wiped out, sound and picture. You can get a booster to amplify the signal, O and the intterference. Correct me if im wrong but when we had analogue mouths moved in time to the voice!! IMPROVEMENT??? It's a total scam! !, we the user never even got asked if we'd prefer more choice at a lower picture quality and less descent things to watch. I hope they will realise that alot of customer won't bother upgrading there system. I can't blame them!. The stuff there putting on TV these days is not worth watching. Then Forced, yes forced! to buy a digital box or tv is totally wrong. If your one of the unlucky ones with a low or poor signal you won't get anything besides a headache!!. I myself will not be watching digital terrestrial television ever! Time to revolt - lol. The delay in the broadcast you are experiencing is nothing to do with whether it is analogue or digital but simply the platform you are using. Satellite signals have to travel 22,000 miles up to the device and then 22,000 miles back down to your dish. Even at the speed of light, this takes time. Digital TVs actually cost more to run than Analogue,do not give as good a picture,and are more prone to faults.But my pet Gripe with digital is that when you are watching an outside broadcast news item from god knows where all you seem to get are heavily pixilated completely out of sync "man on the spot "reports,often so bad as to not be worth seeing. Reason for going digital is simply so more channels can be fitted into the same space so increasing advertising revenue. HD is an attempt to make digital quality up the analogue standard, digital tv cannot give the same quality as analogue but the 'last' generation got used to poor quality video and images, eg mobile phone quality pictures and video recorders using tape so will now accept the poor quality that digital tv delivers. Digital TV is a step backwards re quality but commercial interests were more important than quality. Gripe Number 1: Upon expiry of our old CRT TV, we set out to replace it with a flat screen LCD device. Not so easy! We could find nowhere that had a good range of makes/models that were actually properly tuned into TV channels - both Currys and Comet admitted that we could not compare picture quality because of this. How on earth can one make a choice ? We eventually opted for a small local dealer who at least offered a personal service and included delivery and installation in the price. No, one cannot just bring it home & plug it in any more. Gripe Number 2: Installation ascertained that we could no longer receive some analogue and some digital programmes via our aerial. Since we have SKY this is not an immediate problem BUT if (or perhaps I should say "when") Sky goes down, we do not have access to some programs via the aerial. Also, I cannot use my video to record all analogue channels while they're still available. The reason? We are told that these new TVs need a lot stronger signal and we would need a new aerial if we wanted all channels via the aerial! It's all a nonsense, isn't it! Did the world really have to "go digital"? Thank you Lafcadio - here are my experiences of Digital TV. In the past 18 months I've bought 3 digital receives simply because the old ones gave up - very green. I've had a new TV aerial fitted, the chap that fitted stated that because of "some trees the signal might break up abit". He then proceeded to give me some widget to screw into my main aerial receiver as and when the signal gets poor (then simple swap next time signal deteriorates!!). Just to be clear I'm in South Bucks, 25 miles from central London. Most of the Digital Channels are rubbish/repeats/blank or only one a certain times of the day. My old Analogue signal and 5 channels was fine. Oh and I can't even move to Broadband - local connections speed is sub 1Mb - pathetic isn't it!! Is it all hype, or just me? DTV Those of us who have antennas find that the reception is always breaking up and we don't get the stations we used to. There is no place to gripe to and when you do find a place to gripe they tell you you need a new antenna. So I guess my gripe is why does the Government look for stuff that works so they can screw them up. uh oh...I am in the wrong country. I meant for it for the USA. I do apologize. That explains why I couldn't understand a lot of the above post. We have had digital television since the first of September...Wilmington, NC. "They" tried to act like we were really privileged. If it doesn't improve, there are going to be a bunch of unhappy people soon. I now know not to get involved with anything...and to try not to look forward to anything on television...like the movie that wouldn't come in well last night because the weather wasn't perfect. Then there are the moments when something really significant to the plot is about to be shown or the punch line or a news event just to have the screen freeze until it is over. There are some periods where it works well....as long as it doesn't rain too hard, or get too cold, or there is too much rain or wind...or sometimes some other atmospheric condition that I am not even aware of. I read that the dust has calmed down and they are getting about the same amount of complaints in this area as they received prior to the "big switch." Some of us complain and then what...what good is it going to do? Are they going to stop the switch? Are they going to improve the weather? Should I just put their number on speed dial and call weekly? I have enjoyed reading more and the public radio station here is great. Good luck to the rest of you who will soon be getting this. 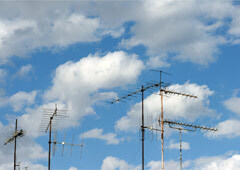 Sky box faults and Sky Insurance - do you need it?